Tag line: "Surrender Your Illusion, Fight For Your Destiny"
Its exciting action sequences aside, director Tsui Hark’s 2001 Zu Warriors is, first and foremost, a fantasy film, building an elaborate, computer-generated world populated by God-like creatures who look as if they stepped out of a fairy tale. The legendary Zu mountains are home to several different clans, immortal beings who’ve spent centuries perfecting a powerful form of martial arts. But when they’re threatened by the demonic Amnesia (Kelly Lin) and his followers, the clans must band together to defeat their common foe. The Omei, led by White Brows (Sammo Hung Kam-Bo), is the strongest of the clans, and succeeds in trapping Amnesia and his minions inside an enormous cave. Leaving his best disciple, Red (Louis Koo), to guard the cave entrance, White Brows finds he must withdraw into solitude to contemplate their next move, and, in his absence, leaves King Sky (Ekin Cheng) of the now-extinct Kunlun clan in command. But when Red falls under the spell of the demon, it kicks off a war that threatens to destroy both the Zu mountains and the entire world below. Every scene in Zu Warriors is filled with spectacular visuals; the world that sits high atop the Zu mountains is a wonder to behold, a mystical place where barely a second goes by without something extraordinary happening. 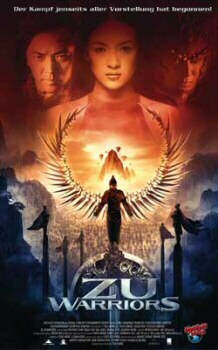 The movie’s characters, many of whom possess incredible powers, are fascinating (I particularly liked Louis Koo’s Red, who had huge, bird-like wings made entirely out of swords), and the fierce battles they have with Amnesia and his demons are, at times, breathtaking. And yet, despite its many impressive qualities, Zu Warriors is not a perfect movie. While most of the special effects are stunning, some fall short of the mark (in a few scenes, characters wield swords hundreds of feet long, which look downright goofy). Also, the story features a slew of different characters, including several mortals (Zhang Ziyi plays Joy, the daughter of a human king, who gets caught up in the otherworldly conflict), and, at times, is a bit muddled and hard to follow. Yet, even with its faults, Zu Warriors is a tremendously entertaining movie, and while those looking for an action-packed martial arts extravaganza a la Hero or Crouching Tiger, Hidden Dragon may be disappointed, anyone who enjoys a good fantasy film will definitely want to check it out.